The Casa das Estórias owes its name to the rich oral traditions of the villages in this area of rural Portugal. On long winter nights, old stories were told by the fireplace, frequently with supernatural or fantastic elements. These stories were passed down from generation to generation and can still be read in regional anthologies today. The entrance door on the ground floor leads directly into a welcoming social space with a kitchen, a dining table, and a cozy living area, with a wood burner, an armchair, and a sofa bed. On the first floor, you can find a bedroom with a double bed, a bathroom and a common area with a comfortable sofa bed. This floor also leads to a large balcony, with a view of the village’s natural pool. An ideal spot for family meals, to read a book, to relax to the sound of the brook or to count stars at night. 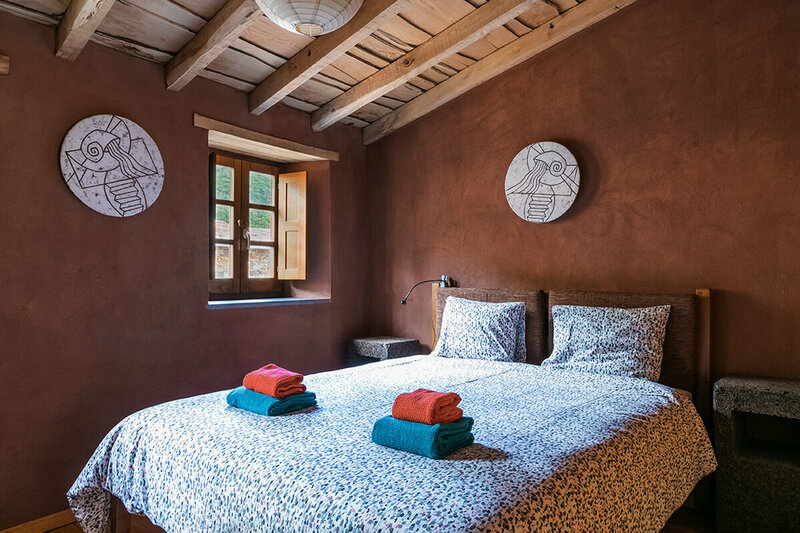 In this house, the artistic work of ceramists Carmina Anastácio and Martim Santa Rita have many stories to tell. Like all the other houses in Cerdeira, the Casa das Estórias has been restored using ecological and regional materials and favouring the use of local contractors. All houses have central heating and offer great comfort, both in winter and summer. To guarantee that you make the most out of the village’s quietness, we have chosen not to install TVs, radio or internet access in any of the houses. In the kitchen, you will find basic staples such as salt, sugar, spices, olive oil and vinegar. Carmina Anastácio is a ceramist working in Sintra at the «Oficina de Rakú». For the Casa das Estórias, she created a large panel composed of contemporary figures who remind us of a tribal imaginary, the writings of ancient civilization and allow us to make up our own stories based on the interaction of its components. On the first floor, Martim Santa Rita’s raku pieces speak to us with great simplicity of life’s great subjects, senses, intellect, introspection and reflexion. * * 2 night minimum stay | * 50% advance. * Prices are quoted per night and house for two adults, breakfast included. Additional charges for additional guests apply: 20€/night for adults, 15€/night for children up to 12 years (inclusive) and 10€/night for a baby cot, if needed.